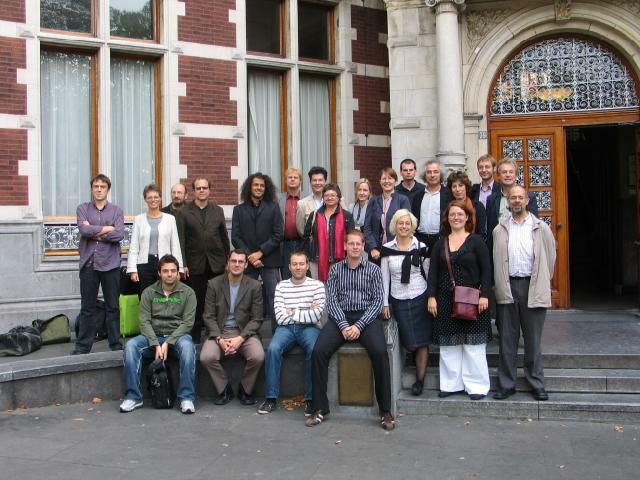 The Video Active consortium gathered on September 27-29 for the kick-off. Over thirty representatives from the participating organisations were present in Utrecht, the Netherlands. Prof. Dr. Sonja de Leeuw (project co-ordinator, Utrecht University) and Prof. Dr. W.H. Gispen (rector magnificus Utrecht University) gave welcome speeches on Wednesday. The project was further intoduced by the project co-ordinator and by each of the work package leaders. All participants contributed to generating ideas on relevant issues such as content selection, intellectual poperty rights, user requirements, technological features and dissemination and exploitation. Also, during the kick-off meeting content providers presented clips from their archives. Pictured: the Video Active project members. Click to enlage. Video Active is a project funded within the eContentplus programme of the European Commission. The major aim of Video Active is to create access to television archives across Europe. The unlocking of these (largely) closed archives will make their content available for educational and academic purposes. It will enable an interactive discovery of television’s cultural heritage. The project will achieve this by selecting 10,000 items television archive content, which reflects the cultural and historical similarities and differences of television from across the European Union, and by complementing this archive content with well-defined contextual metadata. Video Active therefore offers an enormous resource for exploring both the representation of cultural and historical events within and across nations and the development of the medium itself at a cross-cultural level. Audiovisual archival material is notoriously hard to access. Current digitisation activities offer not only the solution for long-term preservation, but also break new grounds for access. Yet such current digitisation at different national levels lacks standardisation, cohesion and still offers uneven access. Video Active will therefore build on existing digitisation activities at different national levels to provide enhanced and equal access to archive content within a well-defined and integrated pan-European framework. To do this the project has brought together eleven leading audiovisual archives, from all across Europe, to make their digitised holdings available online.